I was going out to dinner last night and saw an interesting sight: how they water the plants. 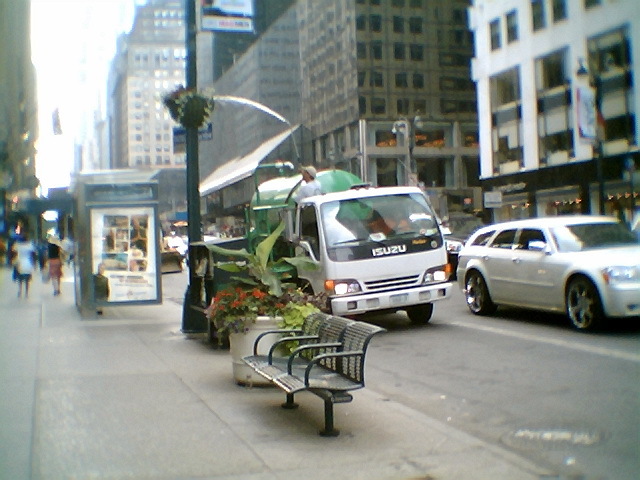 Just a few guys in a water truck trundling along 42nd Street. It looks like I’ve got lots of pictures up now, so I’ll save some bandwidth. Click to make it bigger. So, I’ve finally gone and discovered the “other” Williamsburg. Two weeks ago, I found myself in the Hasidic area of Williamsburg. Today, I found the hipster part of Williamsburg. I keep saying “hipster” as if it really means something to me anymore. I’ve never been part of the trendy set, and in certain ways I’m more at home with the Hasidem rather than the artists that inhabit the northern part of Williamsburg. Nevertheless, I did enjoy myself on both my trips. The big difference: this time I was able to stop and eat when I felt like it. Okay, the upshot of it all is this: Manhattan is outrageously expensive and most of the artistic types don’t have that kind of money. For years, they’ve been going outside of Manhattan and one of their congregating places is Williamsburg. Today, I found at least part of that area and it is pretty interesting. I caught the local subway and got off at Union Square (14th Street) and transferred over to the L train. I’ve never been on the L train, so for the third time in four weeks, I managed to do a little bit of subway exploration, too. 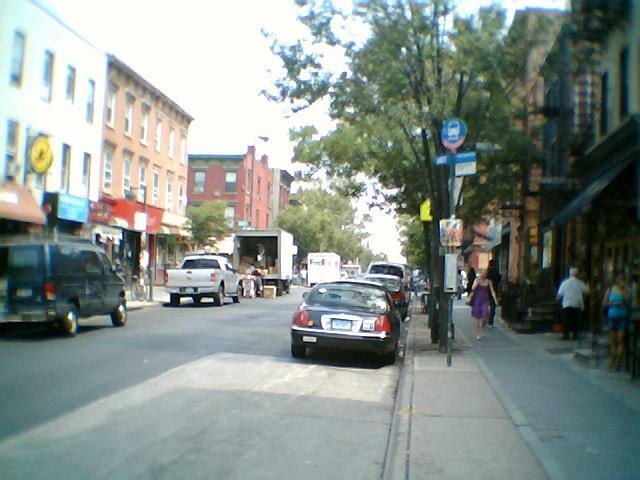 I got to the first stop in Brooklyn on the L train: Bedford Avenue. Here are a couple of views of the street. One of the interesting points about this area are the low buildings. There are a few eight story buildings, but the vast majority are just about three or four stories high. The 30/40/50 story high buildings do exist in parts of Brooklyn, but the smaller buildings dominate it by far. 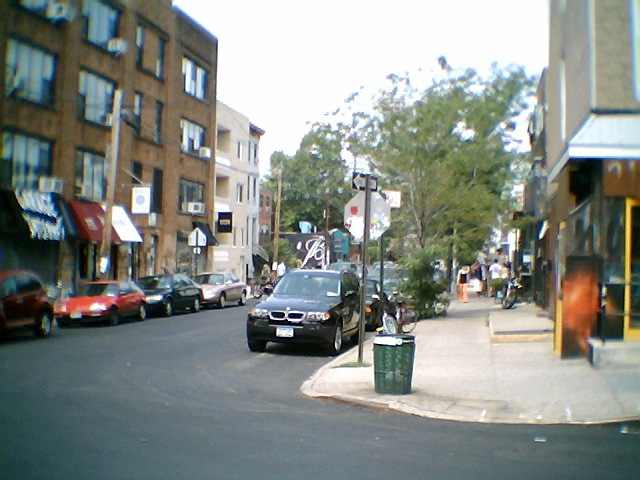 So, I wandered up and down Bedford Avenue for a while. Actually, that isn’t quite true. I wandered up it for about 5 blocks; but it peters out pretty quickly. After about those 5 blocks, actually less than that, you are in a mostly residential area and no longer the commercial businesses. So, I did what I love to do: started exploring the back streets. I didn’t find the “bustling metropolis” in those areas. One thing I spotted more of than usual: people selling junk on the sidewalk. In Manhattan, it tends to be books and DVDs. Here, it looked like some people were just doing some “yard sale” sorts of stuff, but with pretty small selections. 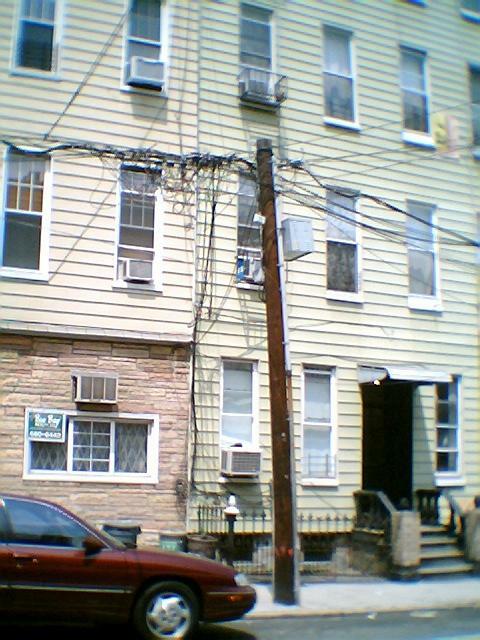 And I did find a nice area that looks a little third-worldish. In one of those back streets, I found an interestingly named business: “Peter Doelgers Extra Beer Bar”. I guess it won’t win any MADD awards. One thing that I like to do: look for what isn’t there. In this case, I found a bunch of restaurants (30 to 40 or so). But, only one was a Chinese restaurant. There were three Japanese restaurants, but just the one Chinese place. That’s pretty unusual in NYC. For a while, I didn’t think I’d find even the one place. I kept wandering and wandering. I actually found myself near the Williamsburg Bridge at one point and near Greenpoint at another time. 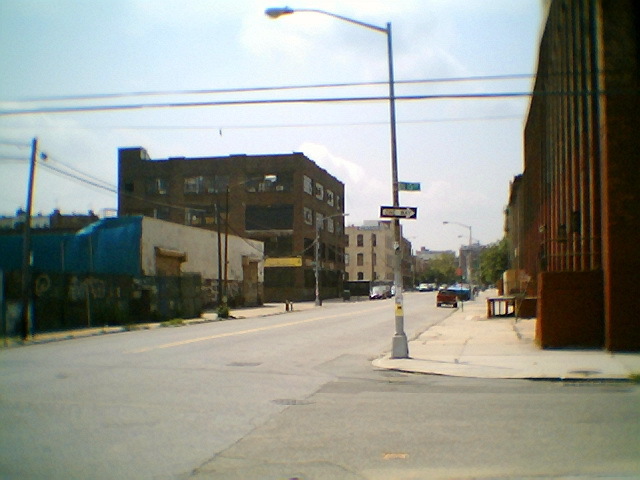 When I realized I was near Greenpoint, and noting that I hadn’t had lunch, I started thinking about going back to “The King’s Feast” for the Polish Plate. However, I just didn’t have the heart to do it again; and I’m glad for that. 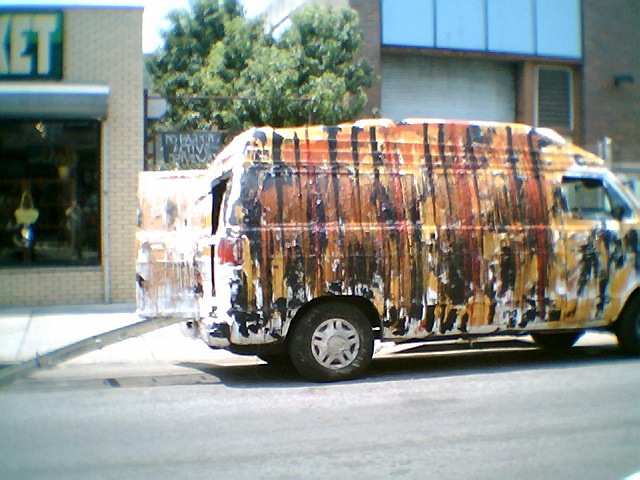 I’m not at all sure about what sort of artistic statement the owners are trying to make. Across the street was a place called “The Surf Bar”. It actually took me a minute or two to find the name as it looks like a complete dive and the owners don’t appear to have a taste for having a sign name outside. What they did have were some old posted food reviews. I took a look and thought that the place had character and decided to go in and try it. The place is tiny and they really are into the surf motif. The floor is covered with sand and the atmosphere is pure laid-back surfer dude. 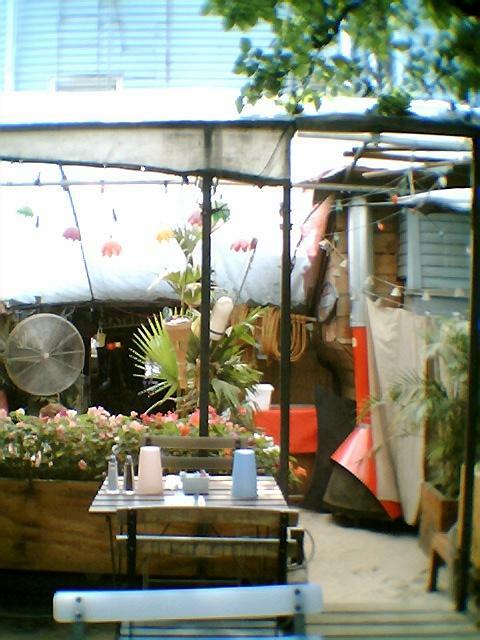 While there, I discovered something that is endemic to Brooklyn, but doesn’t really exist in Manhattan: backyard dining. 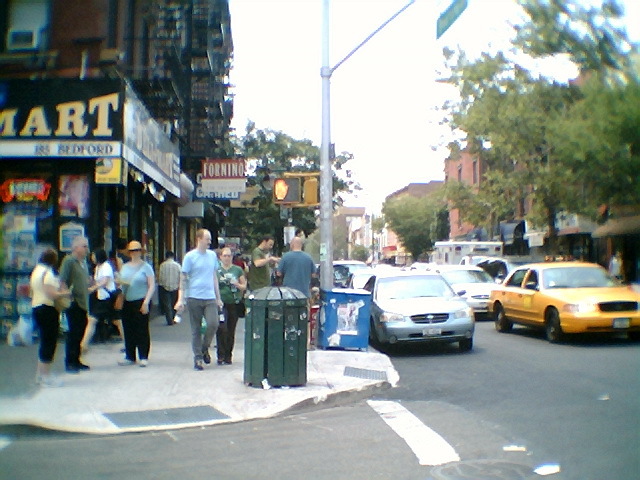 In Manhattan, a lot of restaurants will expand out onto the sidewalk and the seats right next to the traffic are generally pretty popular. 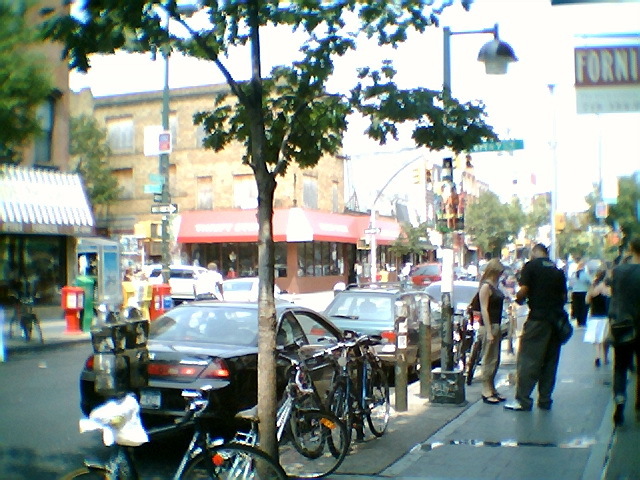 In Brooklyn, the storefronts are very close to the street and it generally has smaller sidewalks. What restaurants do is allow patrons to eat outside in back. 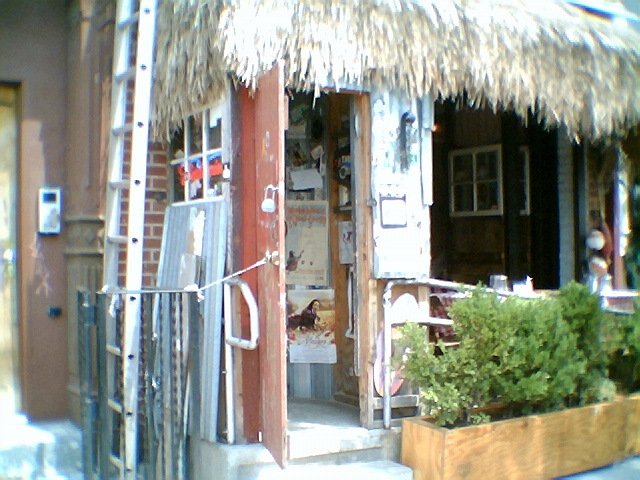 In the Surf Bar’s case, they had trees and a really pleasant and quiet atmosphere. And killer Monkfish Chowder. It was great! So, you aren’t subjected to a third re-telling of The King’s Feast, but do hear about a great chowder from someone who really isn’t all that fond of chowder. I also managed to find a place that looked interesting: Artists & Fleas Indoor Market. It’s just a big open storefront with a number of vendors inside. I’ve seen a similar setup in Little Italy, but this one doesn’t really pull it off. For the most part, the artists appear to be nothing more than T-shirt entrepeneurs. At least it wasn’t the typical T-shirt garbage sold everywhere; but it was only T-shirts. They had 33 1/3 RPM vinyl records and books, too. Some clothing, but it was mostly uninteresting to me. I decided to take Friday off work as this weekend looks a little sketchy weatherwise. I had a couple of errands/tasks to do and thought I might as well take a day as it is a little slow at work. We are back in the Manhattan office, so that’s a nice relief. 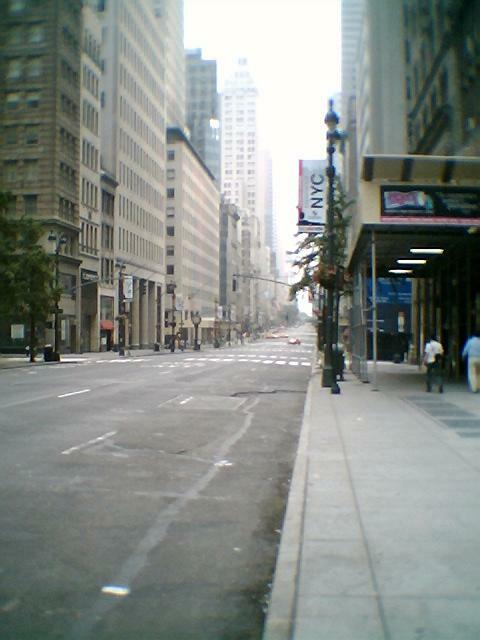 So, this morning, I went down to southern Manhattan, more or less the TriBeCa area. It’s above the World Trade Center area and below Canal Street. There’s a lot of government buildings down there. 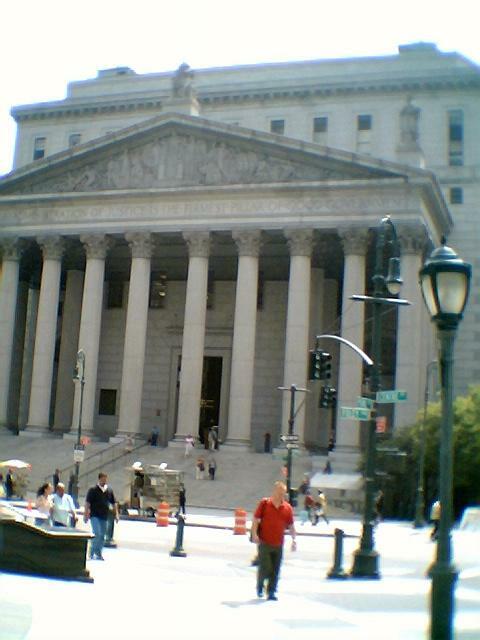 Below is a photo of one of the courthouses. I think this is one that’s shown in the Law & Order opening. One of the ideas that I had was to find the elusive juncture of Duane Street and Reade Street. NYC’s most populous drug store chain is called Duane Reade and I had always thought of it as two partners or perhaps one person. It turns out that there’s a Duane Street and a Reade Street each going, more or less, east-west in lower Manhattan. (I “discovered” the streets when I was on jury duty earlier this year.) I was speculating that the original Duane Reade would be at the intersection of the two streets. It turns out that they don’t really seem to join, but they get real close to each other, seeming to both hit the same sort of traffic circle, at the Courthouse. I guess the mystery of the naming still lives. Incidentally, there’s a “Duane Park” nearby. Duane was NYC’s first mayor after the American Revolution. As I was walking along Duane Street, I ran into the African Burial Grounds again. It’s pretty interesting and is apparently a big draw. The first time I saw it, there was a fieldtrip by a bunch of junior highschoolers going through the area. This time, there was a group or 40 or so people being given a lecture by a Park Ranger. At this point, the grounds are still being built up so I imagine there will be even more traffic once it really opens up. 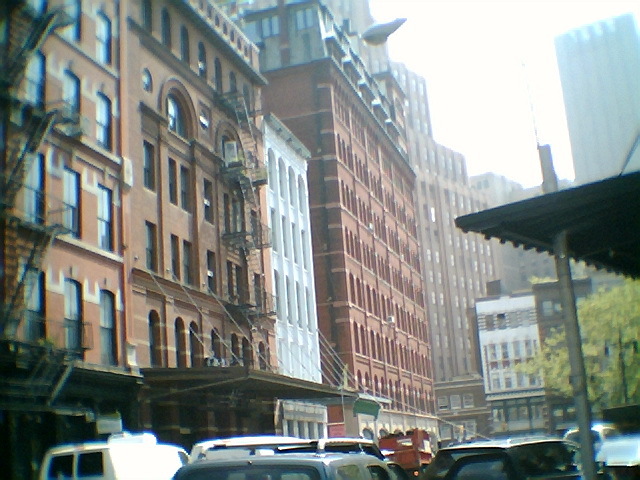 As I walked along Duane Street, I was getting more into the real TriBeCa area. 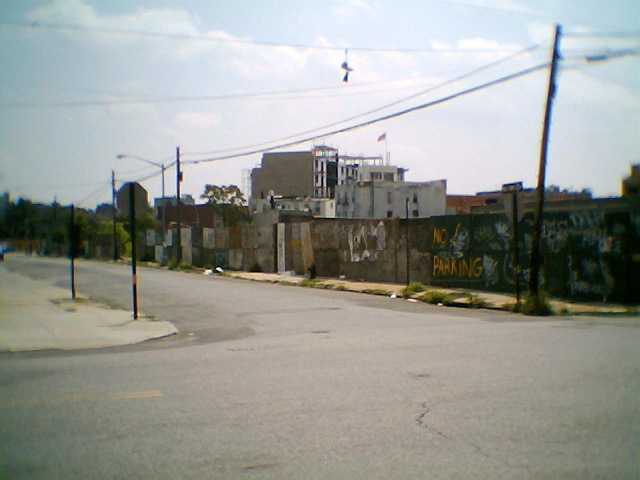 Below’s a photo of the general area. This particular area is reminiscent of SoHo. A little further on, I ran into Battery Park City. 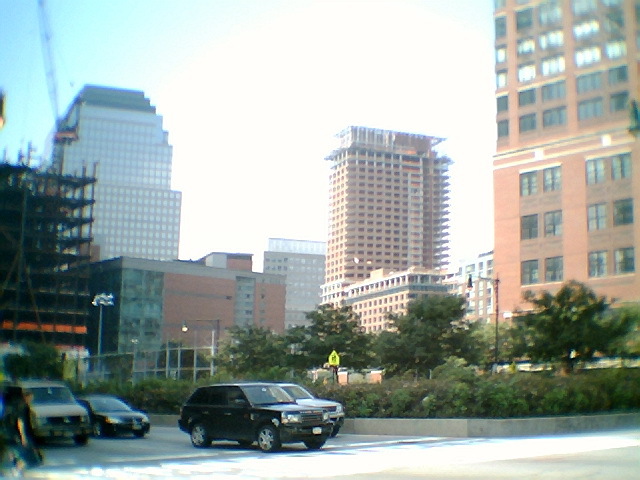 That’s a residential area near the WTC/Battery Park (the most southern tip of Manhattan). Wow! The building continues at a frenzied pace. After 9/11, prices in Battery Park City apparently went way down. They still don’t seem to be extremely high even now. 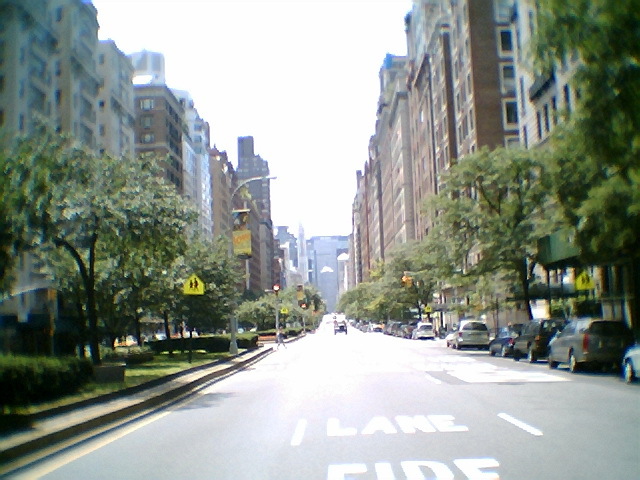 However, southern Manhattan really holds very little for people in the evenings and weekends; plus the monthly maintenance fees for those places is reported to be astronomical. The NY Community College is down there. Maybe it was just seeing one character walking around with the single-most obscene T-shirt I’m aware of (it’s just a sentence with the “F-word” about five times and making no sense other than to indicate that the wearer is a hard-core idiot/jerk/psycho/malcontent), but it just seemed that the general character of the summer students leaves something to be desired. No big deal. I did manage to get onto Chambers Street and go to the “Soda Shop”. I guess it was about a year ago or so that I first started my “organized” wanderings of Manhattan and the Soda Shop was the first place I went to during that period. It was on the local TV show “$9.99” and the show talked about the old style candy and their egg creams. I’ve now been there three times. The first time, I had the egg cream. The second time, I had the lime rickey. This time, I had the “Cracker Jack”. I hadn’t heard of it before, but saw it on the menu. It’s a drink that combines grape soda, seltzer, cherry, and lime. Not bad. But the lime rickey is still the best of the bunch. I thought I had taken a picture of the Soda Shop, but it didn’t come out. Sorry. Not really all that much to see, to be honest. 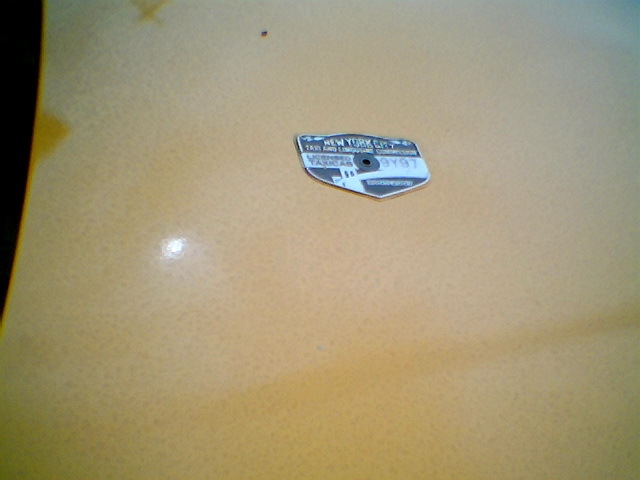 Finally, I kept walking up Chambers Street and saw a minor, but interesting, item. NYC has all sorts of vendors in all sorts of setups. However, on Chambers, I saw two vendors doing business out of places that I hadn’t seen before. They were both operating out of buildings, but the “stores” can’t be described as anything other than closets. It was as if there was a utility closet in the building that these vendors had taken over. One was about four feet deep and maybe three feet wide. With displays hanging from the walls, the “aisle” was about two feet wide, maximum. Most of the store’s display was outside the building. The second place was very similar to it. It was a bit bigger, perhaps eight feet deep, but just as wide. No pictures (I’m embarrassed to take pictures like that as the owners are standing right there, and the interior wouldn’t show up with the quality of my camera anyway). I really did very little today. Just a bit of local wandering and a very long afternoon nap. Church was uneventful this morning. We started with just about 5 of us and grew to 15 or so by the end of the service. 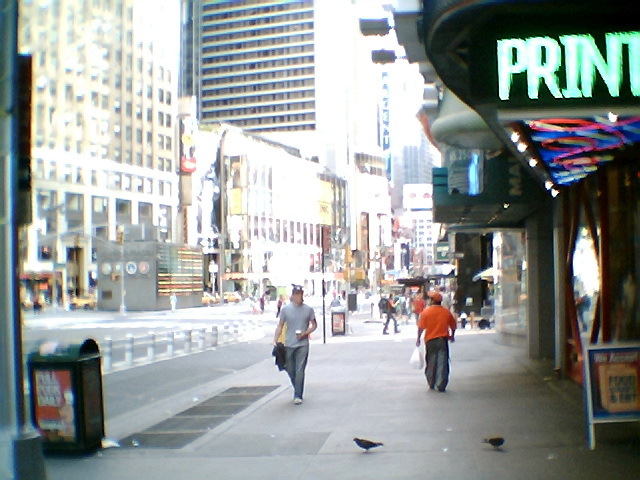 A bad photo of Times Square at 8:30am on a Sunday morning. 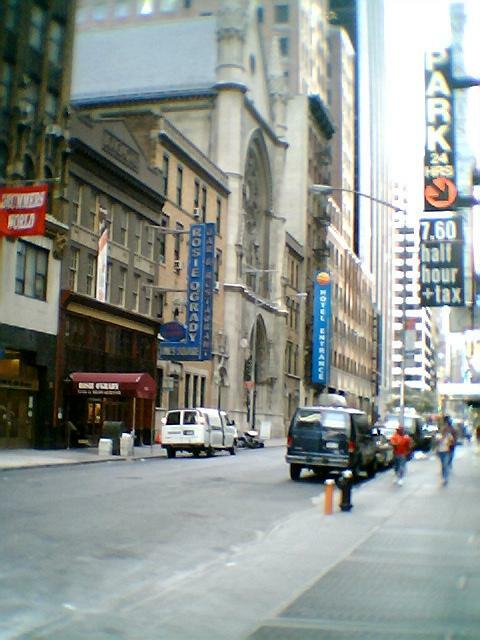 And the Church of St. Mary the Virgin, on 46th between 6th Ave and 7th Ave. It’s the gray building. After Church, I went and got some stuff at Home Depot and did a little work around the co-op. Just some minor stuff that I’ve put off for a while. Then a long nap and some afternoon TV watching. What a boring, but pleasant, day. Late in the afternoon, I went to see how close I could get to the office. I found that they are opening streets very quickly and that’s nice. I passed by a local as he was excitedly proclaiming to his neighbor that “The street’s open, that means the mailman comes tomorrow!”. You forget that that neighborhood, if they weren’t evacuated, were still badly affected. The mail’s a minor thing, but not really. I found that my office building is sort of open. I could get in, but they would only let me go on an escorted trip to my office for a maximum of five minutes. Because I do almost all of my work on the computer, I didn’t need anything, but they wouldn’t let me make any calls from my office to see if others needed something. 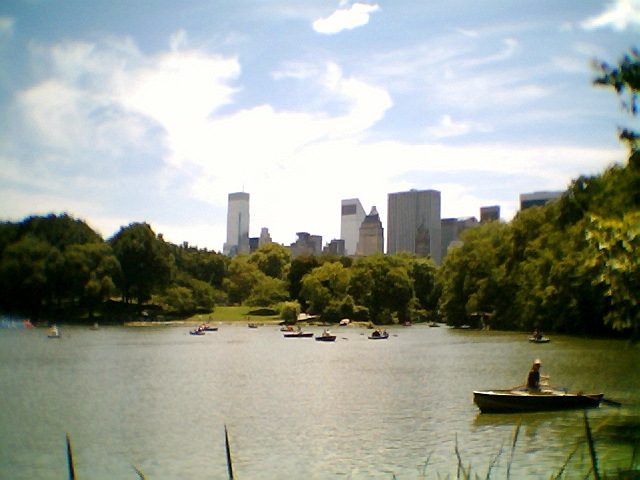 The weather was fine and I decided to take a little trip through Central Park and perhaps run an errand or two. I wanted to see if any more of the “Frozen Zone” was freeing up, but was disappointed to find it unchanged from yesterday. Well….actually the news isn’t even that good. I was walking on 3rd Avenue and found construction crews setting up concrete barriers on both sides of the street. They’re the standard 3 or 3.5 foot high barriers you see on major construction areas and it seems to portend poorly for the future. I have no proof they’ve anything to do with the steampipe explosion, but I imagine they do. They look like they’re going to be around for a while. 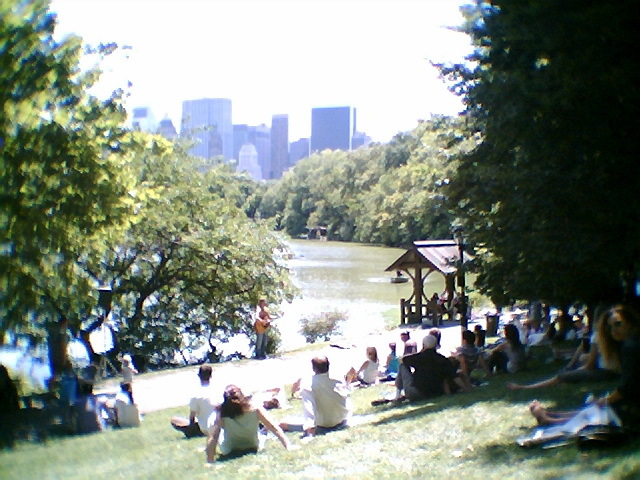 I took the subway up to East 77th Street and wandered over to the Park (the picture above is a view southward from Park Avenue). I had no real destination in mind, but today I really just didn’t want to go into “The Ramble”. I guess I was just a little more lethargic than I expected at the beginning. This time, though, it seemed that the paths kept trying to get me up into it; an offer I refused at least three times. I just kept pushing westward. The only really memorable event while I was in the Park was during one of those “avoidance” manuevers. I was walking and heard a saxaphone player playing “Take Five”, which has to be one of my favorite jazz standards. He was playing under a stone bridge and I made a quick turn to go and listen to him. The acoustics were amazing, of course. Actually, I’ve heard the guy playing a number of times but his stuff usually is a lot more pedestrian and of no particular interest to me. But this was very nice. He didn’t play it well, and it really suffered for not having an accompaniment (it really needs some drums playing softly in the background); but he gets kudos for giving it his all. I listened for a couple of minutes and when he finished I told him that I had enjoyed it and gave him a buck. He then started playing something not to my taste and I moved on. I continued and knew I was getting into an area I have some fondness for. 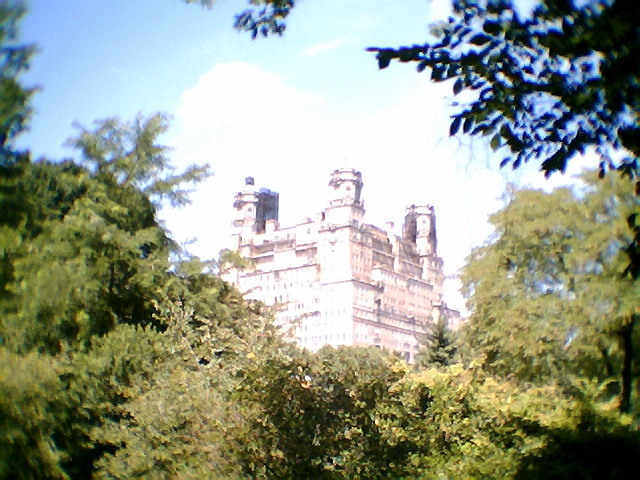 Below’s a picture of the Museum of Natural History on the West Side of Central Park. It’s in this general area that “That Guitar Man” (http://www.thatguitarman.com/) plays every Saturday. I just sort of listened and started following the sound of his music. I once took my cousin Cathy to hear him and I have fond memories of that afternoon’s concert. I listened for a while. He’s really good and I always enjoy it, but I tend to prefer his covers more than his original stuff. They aren’t bad, but I guess I’m just showing my pedestrian taste for the music of my youth. I listened for a while and then moved on. 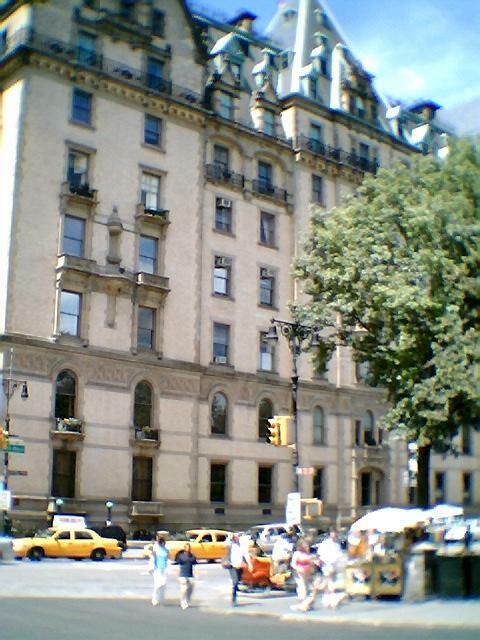 When I exited the Park, I did so at 72nd Street and saw one of my favorite buildings: The Dakota. I always am amazed at the window air conditioners. They are prevalent even in the most august buildings. As I left the Park, I did my big “errand” for the day. I needed to get some money from the bank. I normally use a branch right next to my office; but it is in the Frozen Zone so “no go” for using it for a while. I know there are lots of branches, but since I was in the area I thought I’d go to one I used to occasionally use near my old stomping grounds. While there, I ended up going to “Nick’s” which is a famous greasy spoon sort of place with wonderful hamburgers. Actually, their menu is about 20 pages long and they have only about 15 tables for eating. It was very, very good. I wandered around a bit more. That part of town always has a lot of book vendors on the sidewalks. They seem to buy books at estate sales and the like and then sell them on the sidewalks on the weekends.